Chantix is the commercial name for varenicline. It is one of the latest prescription stop smoking pills on the market. It is not considered to be a nicotine replacement therapy (NRT) since it does not provide a substitute for nicotine to your body. Chantix works by blocking nicotine from reaching your brain that normally associate with your craving and associated addiction to nicotine. 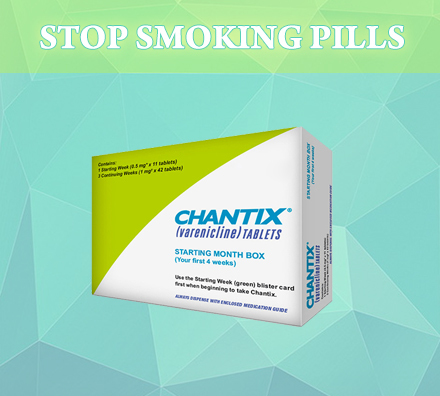 Just like other stop smoking pills and aids, Chantix is not full a fool-proof method, but has been proven to be a major aid in helping people kick the habit. Chantix works through attempting to curb the urges and addiction your body suffers from its addiction to nicotine. When you smoke, nicotine affects your brain by entering your body and attaching itself to receptors in your nervous system. You body then releases dopamine which makes you feel good and become addicted to the feeling that smoking provides you. When the levels of dopamine begin to drop in your body, you get the urge or feeling that you need another cigarette. When you are prescribed Chantix and take the stop smoking pill, it will subsequently attach itself to the same nervous system receptors in your body that nicotine does resulting in a release of dopamine. When you smoke, your body already has dopamine released so there is no subsequent good feeling from smoking. Through taking Chantix, your withdrawal symptoms are reduced and you experience less cravings for a cigarette than you do when using traditional NRT’s. Similar to other prescription drugs, patients who take Chantix may see side effects. Some that have been observed in patients are: headaches, sleep problems (weird dreams to insomnia), constipation, and nausea. In some rare cases, more serious side effects such as significant depression and behavioural changes and suicidal tendancies have been observed. In all cases, if you are prescribed Chantix and using it as a tool to stop smoking, you should report any side effects to your physician in order to see if you need to shift to a different prescription or method to stop smoking. Many of the side effects have been observed in patients who have exhibited depression and other pyschological problems in their past. Side effects have also been more pronounced with patients who are taking other stop smoking medications, those with kidney disorders, and those who are pregnant.